The recently GWR awarded ‘Mudan’ diamond watch by CORONET is an incredible art-piece featuring 15,858 diamonds. The watch is set in 18K gold with artist Reena Ahluwalia’s unmatchable diamond painting on the dial. Reena Ahluwalia’s coveted diamond paintings are hyper-realistic and take hundreds of hours to paint. 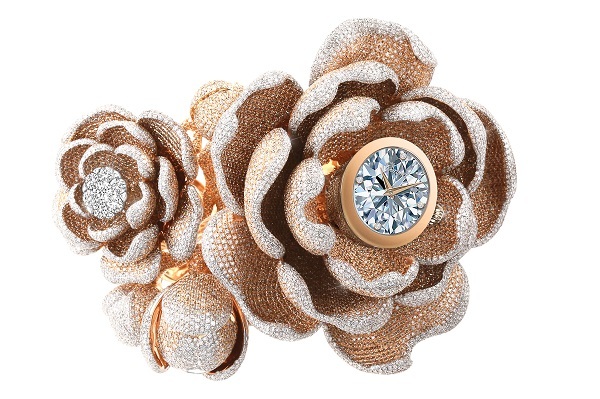 The watch is inspired by Peonies, as they symbolize nobility, honor and wealth. Reena’s diamond painting on the dial represents the shining nobility that we carry within. Peony (Mudan 牡丹) is known as the ‘King of the flowers’ in the Chinese culture. Aaron Shum, founder of Coronet® and President of Aaron Shum Jewelry Limited said, “Since 2015, CORONET is continuously surprising jewelers and fashion lovers at BaselWorld when we unveiled the dazzling Diamond Guitar. This is the ninth time that Coronet has been honored with a GUINNESS WORLD RECORDS title. We are proud to showcase our one-of-a-kind ‘Mudan’ watch with artist Reena Ahulwalia’s masterpiece on the watch’s dial - a hyper realistic painting of a diamond. There are 15,858 diamonds set in 18K gold, and a 3D painting dial with diamonds on 3, 6, 9, 12-hour position. ‘The ‘Mudan’ watch has a total of 50.01 carats of diamonds. CORONET also showcased its latest jewelry collections, including an artistic and exciting new watch collection in partnership with Reena Ahluwalia, featuring Reena’s 3D diamond paintings on the watch dial. 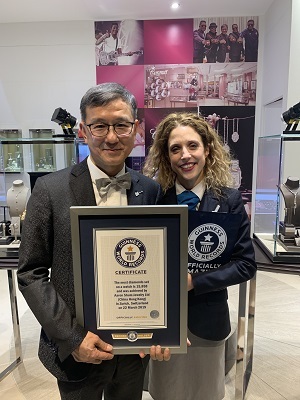 Aaron Shum, president of CORONET receives the Guinness World Records certificate for Most diamonds set on a watch at Basel World 2019.